Santa Claus and some dude are on a snowy mountain running tectonic freeze shifting plate tests. No joke. Santa Claus. It’s complicated. Something bad happens in the form of a CGI snow crack that runs up through the mountain and now Santa Claus and the dude are separated from each other. If the dude had been paying attention he would’ve noticed the evil vapors coming up from the crack and he wouldn’t have tried to jump over the snow crack and thus he wouldn’t have been frozen to death by the evil vapors. Okay, so the vapors aren’t inherently evil, just random methane gas fumes, but I like having some kind of bad guy or monster or evil entity in my movies and considering that this Sci-Fi Original ‘Ice Quake’ has nothing of the sort, from this point on the methane gas is evil. Anyway, Santa in a very un-Santa like move leaves the dead dude behind and gets the hell outta there on his Santa-snowmobile only to be mercilessly attacked by methane based ice geysers. Christmas will not be coming to the children of wherever the hell this movie is taking place. Let’s call it Coldville. Before we continue we sure do hope you like fancy false scientific talk because ‘Ice Quake’ has more fancy fake scientific than any movie this side of ‘Apollo 13’. Coldville is getting rocked by small earthquakes, though nobody seems to care since apparently this happens all the time. Super geologist Michael Webster (Brendan Fehr) knows that shifting ice glacial refractions in Russia are the cause of this, but it is Christmas Eve and family comes first. This family consists of wife Emily (Holly Dingard), bratty teenaged daughter Tia (Jodelle Ferland) and heroic tyke Shane (Ryan Grantham). Like we said, it’s Christmas Eve and Michael being the crap father that he is hasn’t even gotten his kids a tree yet, much less presents, so it’s time to make a special trip, along with Yeti the Dog, to Death Mountain and cut down a tree. Worst Dad Ever. At the base the Colonel (Victor Garber) is concerned because the earthquakes are intensifying their intense intensity and his top geologist is on Death Mountain trying to cut down a freaking tree, so he has no idea what the deal is. Another geologist has determined the underground cavernatic structures are imploding upon their explosive intense rupturing, thus causing these quakes… but why? Hello Methane Man (Rob LaBelle). He has known for years that the gigatonage of flowing liquid Methane in the Cavernatic abyss would eventually rupture along the fragile latitudinal seams. Just like the evil methane killed the dinosaurs. Again, it’s complicated. But the worst part is that our family is trapped on Death Mountain being systematically attacked by snow cracks, avalanches, ice geysers, and evil methane gas. And Yeti the dog is missing. And little Shane has lost his daddy’s Christmas Gift. Oh… waitaminute… the real worst part is that the gigatonage of Methane liquid is making its way to the expulsory geyser expulsion point where it will then shoot into the air, turn into methane gas and kill every single person on the planet earth. That’s the real worst part. This one kind of got lost in the shuffle my friends. I make it point to DVR Sci-Fi originals but I forgot about this one until last night, months later. It’s awful…for sure…considering that most of the major action in the movie consists of people in closed rooms looking at computer monitors and it has a villain that is represented by either a squiggly line on a low resolution PC monitor or represented as heat vapor. Believe me when I tell you that this is not a recipe for a solid end of the world action thriller. In fact as far ‘end of the world’ movies go, death by methane is one of the duller death destruction methods ever devised by a screenwriter. Besides, the whole ‘world ending’ scenario looked like it was tacked on at the end once the filmmakers realized that chasing vapor and snow cracks was so incredibly lame. But we do have to say that this was one of the better acted Sci-Fi originals. Victor Garber, Brendan Fehr, Holly Dingard are all veteran actors and seemed to take this thing deadly serious, the kids were cute and competent, those two hot soldier chicks (Sharon Taylor, Marsha Regis) made sitting in closed rooms looking at low resolution computer monitors feel a little less monotonous and there were a lot of death by snow cracks and death by methane in this movie. The real problem I had with ‘Ice Quake’ outside of the fact that it was boring, was that I don’t think this one really belonged on the Sci-Fi Channel. Because of the whole family in peril angle, the Christmastime hook, the lost dog, the bratty teenager… Cinetel probably should’ve tried to palm this movie off on ABC Family or The Hallmark Channel. 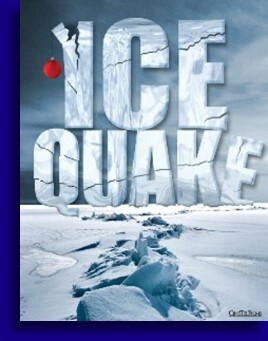 Don’t get me wrong, ‘Ice Quake’ is more than awful enough to be on Sci-Fi, no doubt, but with no chintzy monsters, no mansquitos, no Ice Spiders, no Lorenzo Lamas or Costas Mandylor or Paul Logan or Corin Nemec, it just didn’t feel like a real live authentic Sci-Fi original. Yes, ‘Ice Quake’ isn’t a very good movie, considering a movie that has a highlight of fancy science talk in closed rooms by good looking people is almost doomed from the start. But I think it would’ve been less crappy on another channel.